@deadstretch Hm that's an error in the low-level graphics code, happens when the driver couldn't create the program's window for some reason. Is this on a Pi right? How exactly do you change the resolution? For the vertical setup, I think you'll likely need to create a new theme (or modify the default one), as it's been designed mostly for larger resolutions. You can find the theme development documentation here, with two examples. If you want to hack the default theme (this will get ugly), it's code is here (look for pixelSize values). ES2 files are not changed, so if a game is marked as favorite there, it'll also keep staying favorite in Pegasus too. ES2 support will be disableable in the future. @fluffypillow On a Pi 3b. The resolution switch happens from a run command on start/on end script. I followed this guide to set it all up. I will look into the rest. Thanks. No updates last week due to all kinds of unrelated issues, hopefully this one will be more productive. Maybe I could finally add that letter jump feature. @fluffypillow Look forward to it. @fluffypillow On the controllers, can we not use the back trigger (R2 or LT for example) to jump letters? I think that's how Steam BPM does it. @halfmanhalfcake Oh, didn't know Steam had such feature. Will check it out, thanks. This week there have been a large amount of internal changes. It shouldn't have any visible effects, but in some cases, you might perhaps see a slight performance improvement. @fluffypillow Probably the coolest thing I've seen in a long time. Update: The Android docs are now online here. Just updated to latest version, after a long break away from my arcade build - but now Pegasus won't launch. The splash screen is replaced with the text about locales, games found and after the last line stating how many games are found, nothing else happens... Does not respond to inputs either. 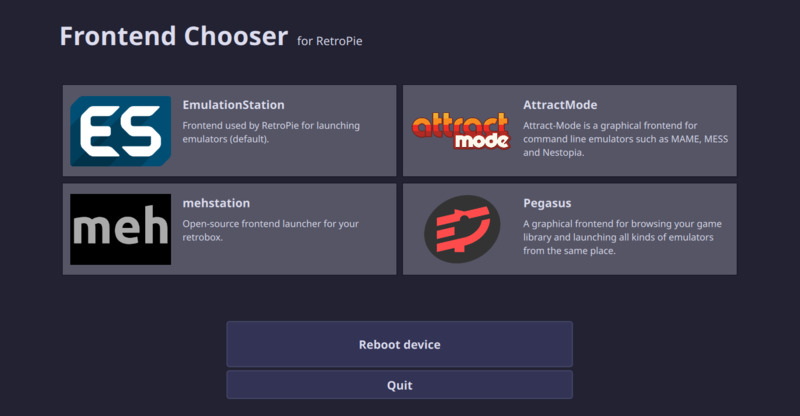 Does the newest version require something like a special version of RetroPie installed or..? qrc:/frontend/menu/settings/MultivalueOption.qml:78 Cannot assign to non-existent property "cursorShape"
@andershp Thanks, that's a bug, I'll fix it right away. @andershp Ok, should be fixed now! I recently tried to test your app on android, but I was unable to make the roms shows up :/, tried everything but with no success. I did make the config file and test various path but nothing, test the internal on external drive. I'm pretty that I followed carefully the config guide. Keep up the good work, and thanks in advance if you have any suggestion. Oh meohmy. :) This looks wonderful. @seya16 Hm, do you see anything interesting in the log file (<pegasus-dir>/lastrun.log)? If possible, try to open it directly on the device with some text editor app (files tend to be out of sync when I open them on desktop, at least for me).